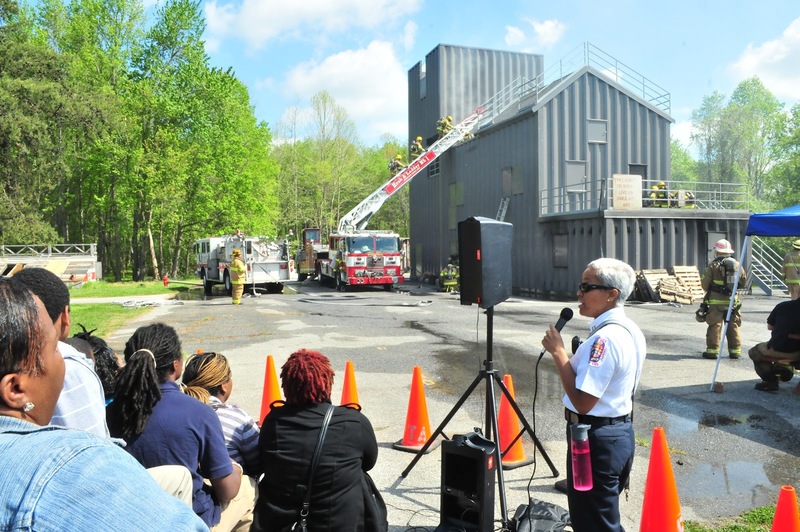 The 35th Prince George's County Public Safety Valor Awards Luncheon will be held to honor the men and women of Public Safety for their heroic actions during incidents occurring in 2011. Gold, Silver and Bronze Medals of Valor in addition to Medals of Honor will be bestowed to deserving individuals of the Fire/EMS Department, Police Department, Department of Corrections, Office of the Sheriff and Homeland Security. Prince George's County Executive Rushern L. Baker III, County Council Chair Andrea Harrison and the Directors of Public Safety Agencies will be on hand to present the Medals. On Thursday morning, April 19, 2012, the Prince George’s County Fire/Emergency Medical Services (EMS) Department Training Academy hosted a group of Central High School students, treating them to a morning filled with fire safety and live fire training observation. The students are from the school’s Community Referenced Instruction (C.R.I.) 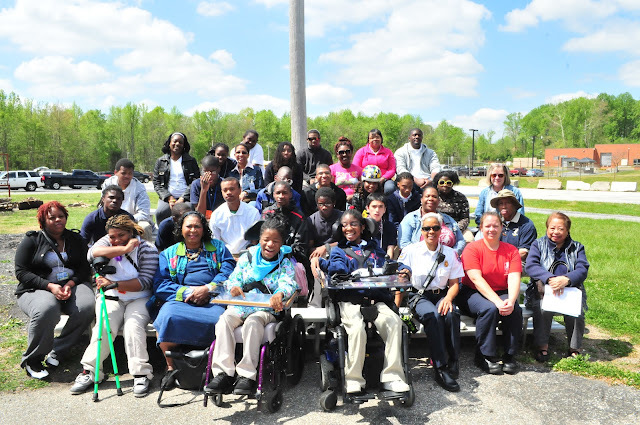 program, which is a segment of Central’s Special Education Department. The core subjects of the program, Reading, Math, and Science, are accessed through the Maryland State Curriculum. However, the program also offers different community-based curriculum. Students in the C.R.I. program graduate with a Certificate of Program Completion. 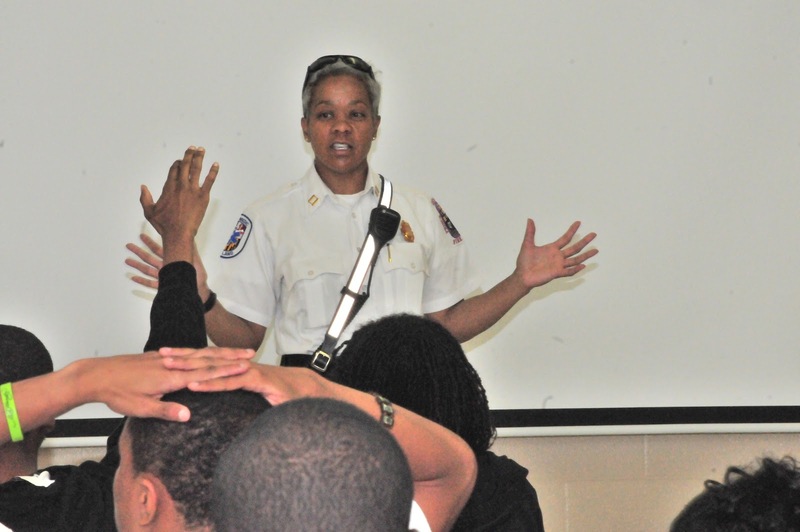 Fire Fighter/Medic Captain Dana N. Brooks’ classroom presentation to the three dozen students and staff included fire safety and a spirited question and answer session. 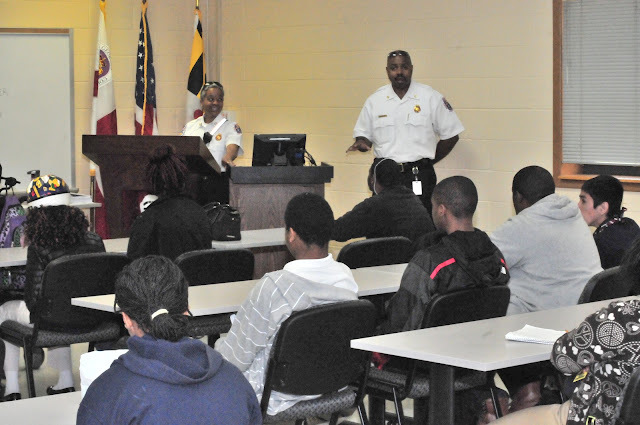 Deputy Fire Chief Neal B. Dennis was on-hand to respond to questions posed by the students and staff. 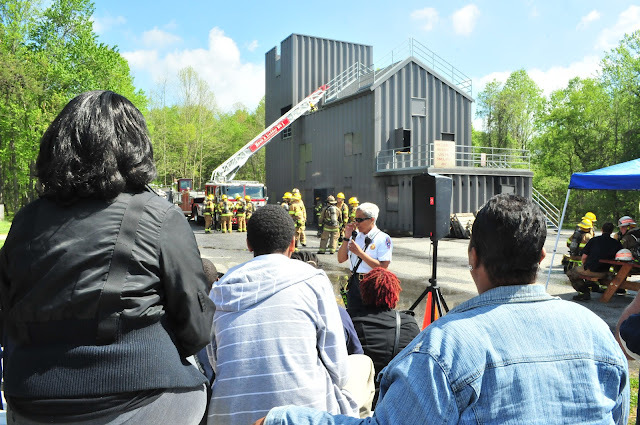 The group then moved outside, where Career Recruit School #45 was participating in live fire exercises at the academy’s burn building. 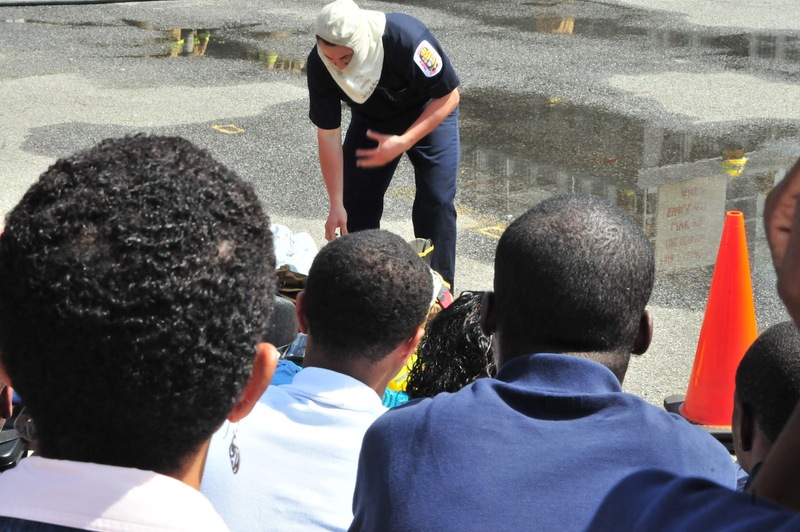 Fire Fighter/Medic Lieutenant Ashley L. Breen assisted Captain Brooks with the outside presentation that included stop, drop and roll; firefighter demonstrating donning personal protective equipment and self-contained breathing apparatus; and rope skills. Prince George’s and Montgomery County Firefighters battled a fire in an Adelphi single family home that caused significant damage and injured two firefighters. Firefighters were dispatched at around 12:45 am, Monday, April 23, 2012, to the 10100 block of Riggs Road and discovered a working fire in the basement of the house. An interior attack and search and rescue of the structure were immediately initiated. All searches proved negative with occupants having escaped safely prior to the Fire Departments arrival. The fire was rapidly extending and conditions inside were deteriorating to the point where personnel were forced to evacuate. 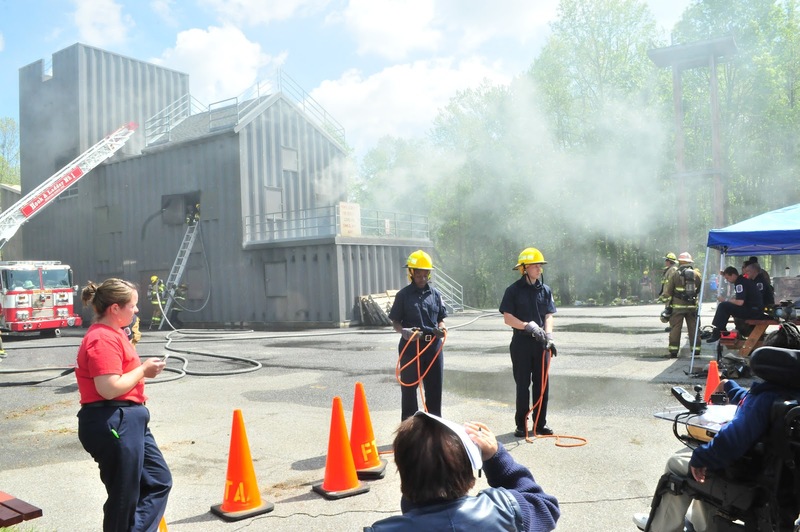 It required nearly an hour for the fire to be extinguished. Two firefighters sustained minor injuries with one being treated and released from an area hospital. The County Citizen Services Unit assisted the nine adult occupants with temporary shelter. Fire Investigators continue to investigate the cause and origin of the fire and they estimate fire loss at about $100,000. Firefighters battled a fire in this 1-story with basement single family home in the 10100 block of Riggs Road.